NAMM 2013 PRESS RELEASE: PreSonus today unveiled its new Eris™-series studio reference monitors. These ultra-affordable, 2-way, bi-amped monitor speakers deliver very accurate response with a tight bass and very clear upper end. 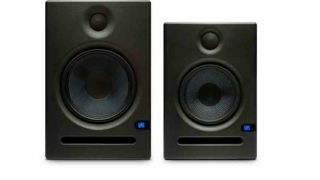 They can also be user-adjusted to the acoustic space, allowing you to create a more accurate listening environment or to simulate different common listening environments - a feature not typically provided by studio monitors in this price point. Both Eris models have individual balanced XLR and ¼" TRS input connections in addition to unbalanced RCA inputs. Both offer RF shielding, current-output limiting, over-temperature protection, and subsonic protection. Users also can make several types of custom adjustments. A four-position Acoustic Space switch controls a second-order shelving filter, centered at 100 Hz, that provides three attenuation points (no attenuation, -2 dB, and -4 dB), allowing you to control the bass response relative to the wall proximity of your speakers. A High Pass switch sets the low-frequency cutoff (second-order slope, -12 dB/octave) to be flat, 80 Hz, or 100 Hz. You also get continuously adjustable High Frequency and Midrange controls from -6 dB to +6 dB. This combination of controls lets you create a linear response for accurate monitoring. It also enables you to simulate different listening environments, so you don't have to listen to mixes on your car, consumer computer speakers, and home stereo to check how the music sounds with different systems. Instead, you can adjust the Eris monitors' response and test your mixes without leaving your studio. No other monitors in this price class offer this degree of control. The Eris E8 and E5 are expected to be available in April 2013.